No bake cookie recipes have always been popular with cooks because they save time — they don't require any baking — and they don't heat up the kitchen in the warm weather. These were some of Mom's favorite recipes for making homemade cookies. Being a farmer's wife meant there was not always enough time for baking. Being able to make these no bake treats often saved the day. You can make old fashioned no bake cookies, bars, and squares that are scrumptiously chewy and delicious, and they have a sweetness and texture all their own. These are perfect treats for gift giving, parties, serving at special occasions, and for putting in school lunches. 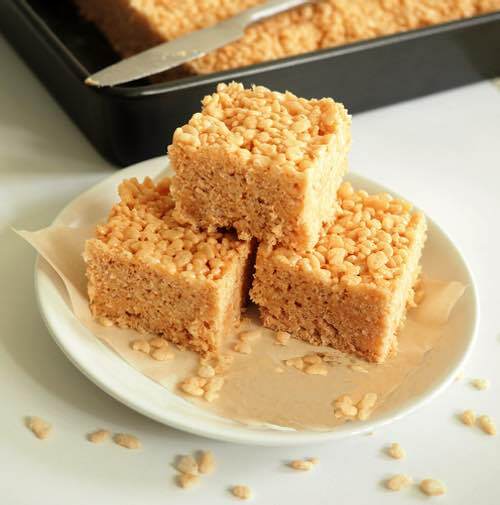 Begin with the retro Rice Krispies squares recipe. Everybody loves them! 30 marshmallows, 1/3 cup butter, 1/2 tsp vanilla, 1 pkg Rice Krispies (5-1/2 oz). Melt butter and marshmallows in double boiler. Add vanilla, beat thoroughly to blend. 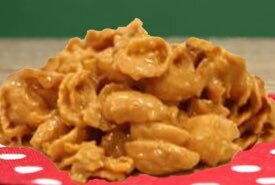 Put Rice Krispies in large buttered bowl and pour on marshmallow mixture, stirring briskly. Press into shallow buttered pan. Cut in squares when cool. Yields 16 2-1/2 inch squares from a 10 x 10 inch pan. Nutmeats and coconut may be added. 2 well-beaten eggs, 1 cup brown sugar 1/2 pound (3-1/4 cups approximately) finely chopped, pitted dates; 1 teaspoon vanilla, pinch of salt, 3 cups rice cereal, 1 cup (approximately) shredded coconut. Combine beaten eggs, sugar, dates, vanilla and pinch of salt in saucepan. Cook slowly, stirring constantly, for about 10 to 15 minutes or until mixture thickens. Remove from heat and allow to cool. Stir rice cereal into cooled egg mixture. Shape into balls, each about the size of a large walnut. Roll in coconut. Makes about 3 dozen cookies. You just have to try this no bake cookie recipe! I loved it when Mom made these sweet, melt-in-your-mouth strawberries. They are SO good tasting. 1 fifteen-ounce can sweetened condensed milk, 6 cups shredded coconut, 3-1/2 cups (approximately) sifted confectioners' sugar, 1 package strawberry-flavored jelly powder, 20 drops red food coloring. Combine milk, coconut, sugar, jelly powder, and red food coloring in bowl. Mix together well and chill. Form into shapes of average-sized strawberries. Roll strawberries in 2 to 3 tablespoons of strawberry-flavored jelly powder. (It will be necessary to open a second package.) 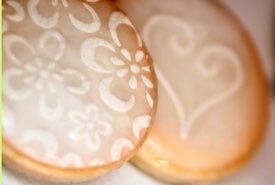 Add a few drops of green food coloring to a small quantity of royal icing. Use it in a cake decorating tube to make a stem and 2 leaves on each strawberry. Makes about 30 strawberries. 1/4 cup butter, 1/2 cup grated chocolate, 1/2 teaspoon vanilla, 1/2 lb marshmallows, 5 cups rice cereal. Melt butter and marshmallows over boiling water, stirring often. Add vanilla and beat well. Mix well with cereal and chocolate. Press into a large buttered pan; when cool, cut into sticks or bars. 2 cups moist coconut (shredded), 1/2 cup peanut butter, 4 teaspoons vanilla. Mix all ingredients, keeping back 1/2 cup coconut; shape mixture into balls and roll in remaining coconut. 1 lb tin of dried milk powder, 1 cup boiling water, 7 tablespoons sugar, 4 tablespoons cocoa. Dissolve sugar in water, then add to dried milk and cocoa, mix it well. Place layer of chocolate in a flat tin, a layer of the filling, and top with a layer of chocolate. Set overnight and cut into small bars. Cream Filling: Mix 1/2 lb icing sugar to a stiff paste with 1 tbsp condensed milk, 1 tsp vanilla. Delicious! 1/2 cup butter or shortening, 2 cups white sugar, 5 teaspoons cocoa, 1/2 cup milk, pinch of salt. Put ingredients in pot and boil 5 minutes; then add 2 cups rolled oats and 1/2 cup chopped walnuts or raisins or coconut; mix, and pour into pan and cool; cut in squares. Excellent for when you're in a hurry. It can be argued that strictly speaking this isn't a no bake cookie recipe, but these little treats are moist, sweet, chewy, and every bit as satisfying to munch on as cookies. Slit large, fresh California dates along one side. Stuff with plain or salted walnut halves, almonds, cashews, or candied orange peel or fondant. Roll in fine sugar. Store in covered container to ripen.